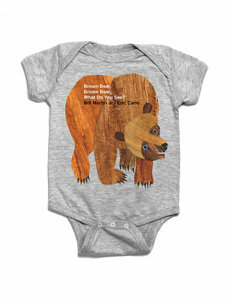 From the first edition cover of Brown Bear, Brown Bear, What Do You See? by Eric Carle. Pair it with the book for the perfect baby shower gift! Perfectly sized for toddlers, this Brown Bear rocker toy has a soft plush body and sturdy wooden handles and frame. Recommended for ages 2-4. Colorful wood rings teach color and size, while stacking the rings help children learn about weight, volume, counting and sequencing. 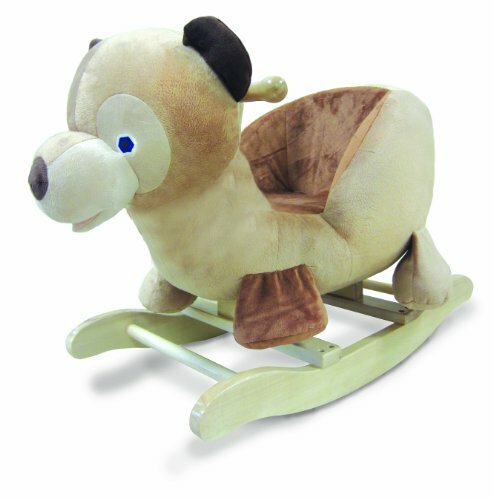 The rounded base design allows for safety and a fun rocking motion. For ages 6+ months. Blank inside with coordinating envelope. Printed with soy inks on 60% tree free recycled paper. Card measures 4.25" x 5.5". Artwork by Josie Portillo. Please allow 2-3 weeks for delivery. Additional shipping costs may be necessary to international destinations. Let The Carle Bookshop create for you a sweet bundle of baby books, perfect for your next baby shower or gift-giving occasion! 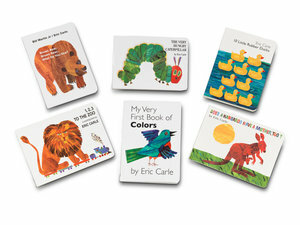 Bundle includes six favorite Eric Carle board books, essential for every new baby's library. Bundles will include the following items while supplies last; (Appropriate exchanges will be made if an item is no longer available). Each bundle is wrapped in exclusive Eric Carle wrapping paper and comes with a coordinating card. If desired, please fill in any personal messages to the recipient for the card in the text box below. Set of 5 soft flashcards on a plastic on-the-go clip. Featuring a lenticular cover design and crinkle pages to stimulate baby's development. Ages 0 and up. Let The Carle Bookshop create for you a sweet bundle of baby books, perfect for your next baby shower or gift-giving occasion! 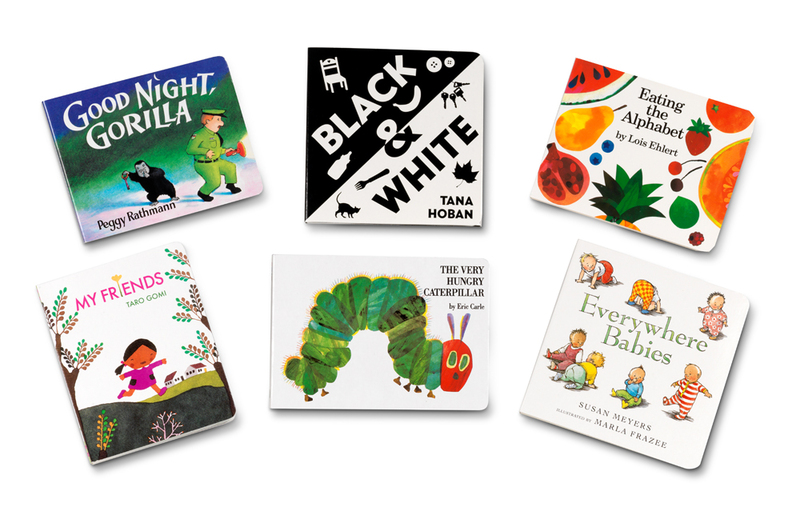 Bundle includes six favorite board books, essential for every new baby's library. Let The Carle Bookshop create for you the perfect Eric Carle-themed bundle for your next baby shower or gift-giving occasion! Bundle includes our very favorite, must-have Eric Carle books and products to welcome a new bundle of joy. 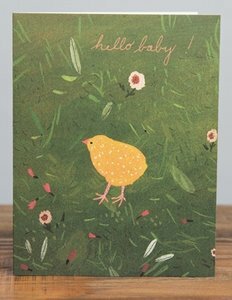 Adorable new baby card with text "Welcome little one". Blank inside with coordinating envelope. Printed with soy inks on 60% tree free recycled paper. Card measures 4.25" x 5.5". Artwork by Becca Stadtlander. Let The Carle Bookshop create for you the perfect Caterpillar-themed bundle for your next baby shower or gift-giving occasion! Bundle includes our very favorite, must-have Caterpillar products to welcome a new bundle of joy. Complete with Eric Carle's animal illustrations, this growth chart is a beautiful way to chronicle a child's growth. Measuring up to 6 feet (so children can compare their height to siblings and parents) and with stickers for marking those memorable milestones, this chart serves as a lovely keepsake of a child'searly development. 5 piece melamine dish set includes: Sectioned plate, bowl, cup with lid, fork and spoon. Top rack dishwasher safe. Not suitable for microwave. Cup not suitable for hot or carbonated beverages. Ages 6 months and up. This 5 piece Melamine Feeding Set makes any meal time a ton of fun. The set includes a sectioned plate, a bowl, a sippy cup, and a fork and spoon painted with colorful drawings from The World of Eric Carle storybooks. 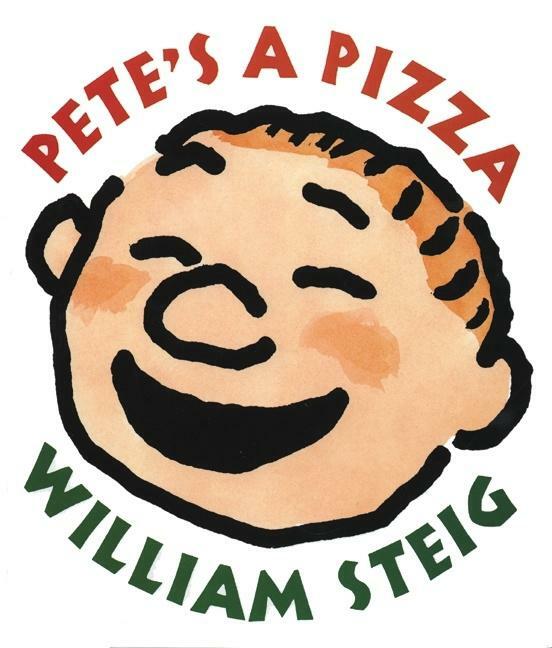 Your child's favorite stories will be brought to life at dinner time. They will come running to eat their vegetables and drink their milk. All pieces are top rack dishwasher safe and come with a matching gift set. Super-soft and lightweight swaddle blanket featuring the colorful and iconic artwork of Eric Carle's The Very Hungry Caterpillar. Works well as cover for nursing, strollers, and burp cloths. Bamboo cotton blend benefits: breathable, soft, regulates body temperature, & green friendly. -- 70% Bamboo, 30% Cotton. Measures 45" x 45"
Pair it with the book for the perfect baby shower gift! Child growth chart printed on sturdy artist canvas. Grommets placed in the four corners make them easy to hang. We provide color coordinated decorative covers that easily fit over the screw or nail you choose. This product creates a great childhood keepsake, and rolls up easily for safe storage. The growth chart can be wiped clean with a soft, dry or slightly damp cloth and should it wrinkle, the backside may be ironed on a low setting with light steam. A permanent marker (not included) is a great way to mark dates or ages on the chart. Please note: This item is printed to order and ships in 2-3 weeks. Please allow 2-3 weeks for carpet delivery. Additional shipping costs may be required for some international destinations. 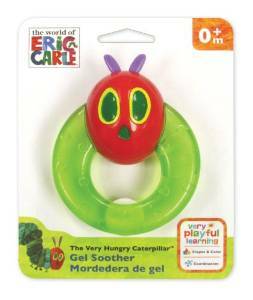 This teething ring features silicone handle with a plastic Very Hungry Caterpillar head. BPA-free, this gel filled ring makes a baby-safe toy and when chilled, makes for a soothing relief for teething pains. Featuring Eric Carle's iconic artwork from The Very Hungry Caterpillar(TM), this interactive growth chart provides the perfect way to chronicle a child's growth. Measuring more than 5 feet (1 meters) tall, and including more than 25 stickers to record memorable milestones, it is a timeless keepsake of a child's development. 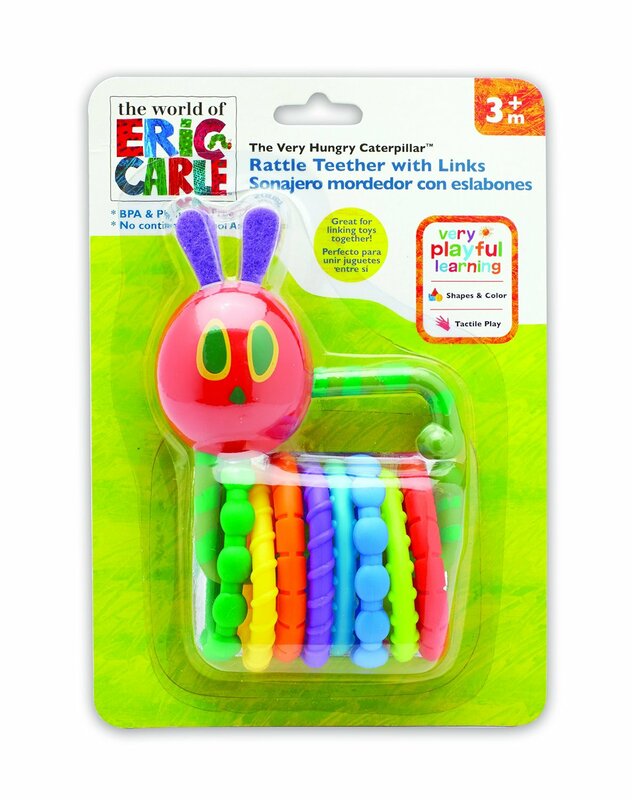 These Very Hungry Caterpillar Teether Links are perfect for babies experiencing the discomfort of teething. The bright colors and various textures of the links engage the senses while relieving teething pain for little ones. 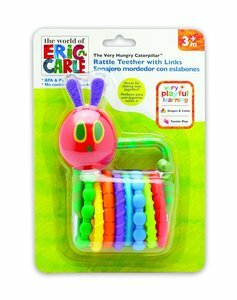 Perfectly sized for toddlers, this Very Hungry Caterpillar rocker toy has a soft plush body and sturdy wooden handles and frame. Recommended for ages 2-4.